Before news organizations began putting their content online, people got the news in print or on TV and almost always outside of the workplace. But nowadays, most of us keep an eye on the headlines from our desks at work, and we have become accustomed to instant access to a growing supply of constantly updated stories on the Web. This change in the amount of news available as well as how we consume it has been coupled with an unexpected development in editorial labor: rival news organizations can now keep tabs on the competition and imitate them, resulting in a decrease in the diversity of the news. 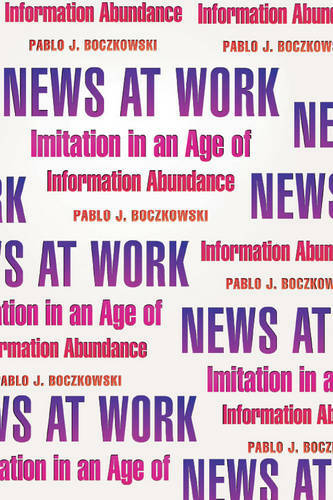 Peeking inside the newsrooms where journalists create stories and the work settings where the public reads them, Pablo J. Boczkowski reveals why journalists contribute to the growing similarity of news - even though they dislike it - and why consumers acquiesce to a media system they find increasingly dissatisfying. Comparing and contrasting two newspapers in Buenos Aires with similar developments in the United States, "News at Work" offers an enlightening perspective on living in a world with more information but less news.